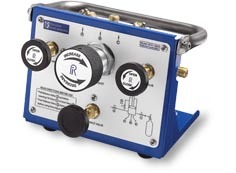 Ralston Instruments offers more ways to control compressed gas than anyone in the industry. A traditional pressure regulator and needle valves work by filling and bleeding the pressure which wastes a great deal of compressed gas. Because pressure regulators are designed to work with flowing gas or liquid they work very poorly when there is no flow. A compressed gas control device actually changes the volume of a closed system to control the pressure. This approach makes it more accurate and easier to use. The pressure balanced design of the QTVC and NPAK models provide higher precision due to smoother operation and larger piston diameter. Regardless of the process being controlled, Ralston Instruments makes a compressed gas control device to serve the purpose. 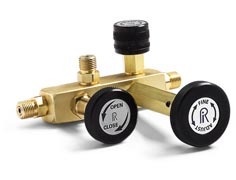 Made in America using the highest grade parts, our manifolds are the most economical way of performing static pressure calibrations in the shop or in the field. Select a single manifold or opt for the convenience of a fully integrated calibration kit – either way, our units adapt to your needs. For the ultimate in accuracy with a wide pressure range, Ralston Volume Controllers provide highly stable pressure control from vacuum to 3000 psi. Coupled with nitrogen or other compressed gas to control pressure, our Volume Controllers regulate pressure precisely without time consuming pumping. Ralston Volume Controllers are the next generation of calibration instruments. 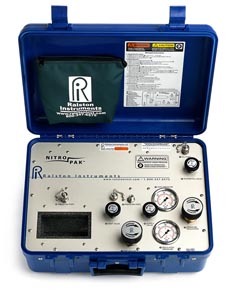 When you need to perform pressure calibration in remote locations, a Ralston Intruments Nitropak is your best option. This fully integrated calibration kit contains everything you need — from a compressed gas cylinder, pressure regulator, hoses, adapters all contained in an extremely rugged carrying case with rigid foam that keeps instruments securely in place. Set up takes seconds and precise pressure control is easy to achieve despite difficult or remote working conditions.